This post brought to you by E*TRADE. The content and opinions expressed below are that of Sweating the Big Stuff. With Tax Day close at hand, you may be wondering how to invest your refund in a more tax efficient manner. You are not alone. According to a StreetWise survey conducted by E*TRADE, many investors, though tax conscious, fail to make use of all the tools that they have at their disposal in order to ensure that their investments are as tax-efficient as possible. Thousands of investors are paying more tax on their investments than they actually should be. You may be one of them. Tax laws can be tough to negotiate. It can take years to figure out all the legal loopholes on your own. Fortunately, there are experts out there that have done the heavy lifting for you. If you want some really great, free advice, visit the E*TRADE Education Center. E*TRADE wants you to win at investing and so they provide some excellent advice – to use the E*TRADE Education Center, you don’t even need to log in – you can access the advice that you need, without having to hand over any personal details at all. 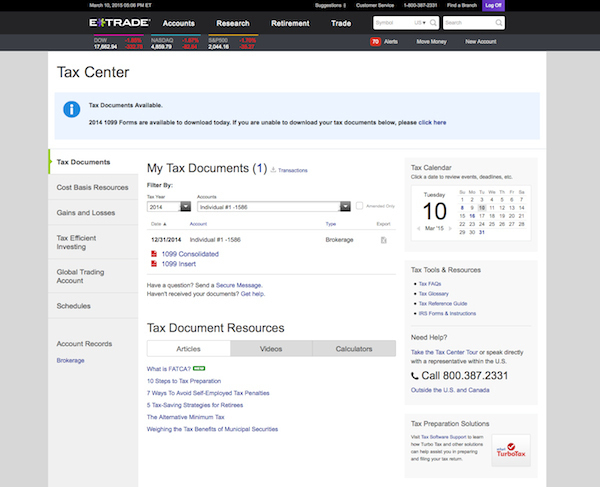 If you do want more assistance when it comes to managing your taxes, now and in the future, E*TRADE’s Tax Center (available to customers) offers a suite of tools and resources, covering everything from cost basis reporting to managing capital gains and losses, to frequently asked tax questions. You can open an online brokerage account and manage everything from one convenient platform. 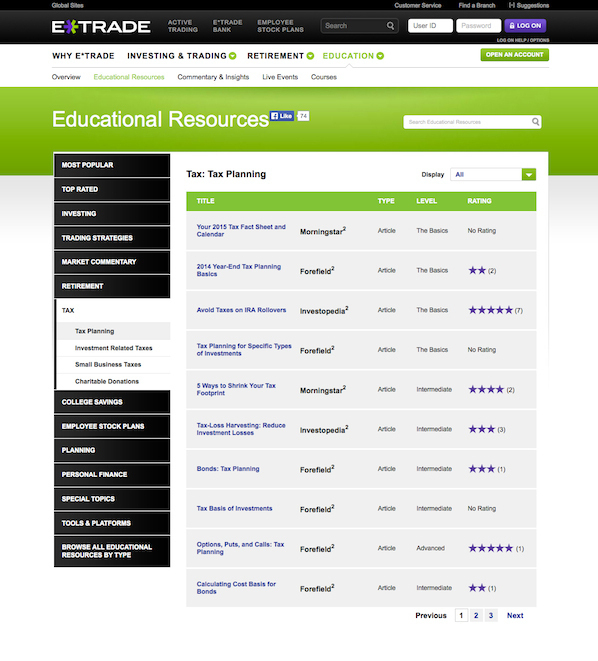 Access the tools and information that you need as and when you need to. Get the right advice to help you make tax and investment decisions fast and start building your own investment empire. E*TRADE has made it their business to understand what investors need when it comes to managing their taxes. Their survey highlighted a distinct need that investors have for cost-effective, timely advice and tools to help them manage their taxes more effectively. Investors are taking more of a front seat when it comes to actively managing their investments and do understand some of the basics when it comes to tax efficient investing. Most investors agree though that they could learn more. E*TRADE found that the use of tax advantaged accounts came up as the top investment strategy for those surveyed, with 45% of respondents agreeing that these accounts are the most effective investment strategy when it comes to reducing their tax liability. For younger investors, that number is even higher – around about 60% of trading activity for younger investors was processed through their IRAs. What are your current investment strategies? Are you getting the best possible advice when it comes to managing your taxes and decreasing your tax liability? Head over to E*TRADE today for top tax advice and resources, set out in a very user-friendly format. Why pay Uncle Sam a dime more than you need to? Get great advice now so that you know exactly how to invest your refund on Tax Day. Sign up for an account and you can invest your refund on Tax Day without even needing to leave your office.